Welcome to the Crazy Crafters' Blog Hop with our Special Guest stamper, Wendy Lee - we are thrilled to have Wendy join us this month and so excited to CASE (Copy And Selectively Edit) any project that has been created by her. Wendy's card uses a product that has never been available in Australia but I really like the way the foliage creeps out from the edges of the window so I set out to create my own version! This background was perhaps a little busy but I wanted to do something a little different! Deciding to use another of my Brusho backgrounds on Glossy White cardstock, I first embossed it with the Leaves folder. Then, after wiping it well with my Embossing Buddy, I gently swiped my Versamark pad across the embossed surface, added Copper embossing powder and heat set. I cut a window in the front of my Night of Navy base card using the largest of the Lots of Labels framelits and then cut some Night of Navy leaves with one of the dies in the Eclectic Layers set and adhered them to the card - tucking them between the card front and the Brusho layer. 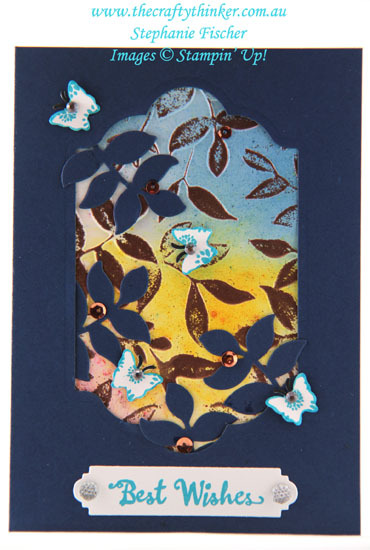 The greeting from the Petal Palette stamp set is stamped with Tempting Turquoise ink and cut with one of the Petals & More dies. I added some Clear Faceted Gems to add a bit of sparkle. The butterflies were cut with one of the Move Me dies. I stamped them with Tempting Turquoise ink and one of the Background Bits stamps then edged them with a Tempting Turquoise Stampin' Write Marker and coloured their antennae with a black marker. 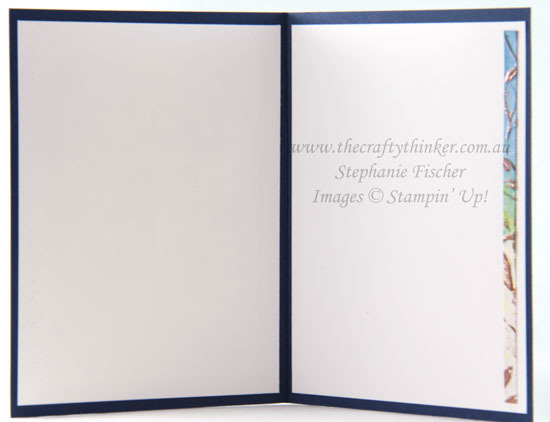 A piece of Whisper White cardstock covers up the back of the inky paper and creates plenty of space to write!